Before we proceed further, it is good to understand the licensing terms of AutoIt. As I mentioned in my AutoIt - Basics post, AutoIt is a Freeware tool. It is licensed, but not sold. You may install and use unlimited number copies of the tool. 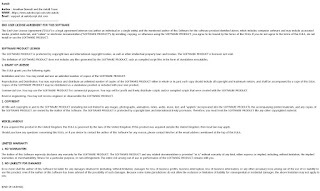 You may reproduce and distribute an unlimited number of copies of the the tool either in whole or in part; each copy should include all copyright and trademark notices, and shall be accompanied by a copy of tool's EULA. Copies of the tool can be distributed as a standalone product or included with our own product. Commercial Use: You may use the the tool for commercial purposes. You may sell for profit and freely distribute scripts and/or compiled scripts that were created with the tool. COPYRIGHT: All title and copyrights in and to the tool (including but not limited to any images, photographs, animations, video, audio, music, text, and "applets" incorporated into the tool), the accompanying printed materials, and any copies of the tool are owned by the Author of the Software. 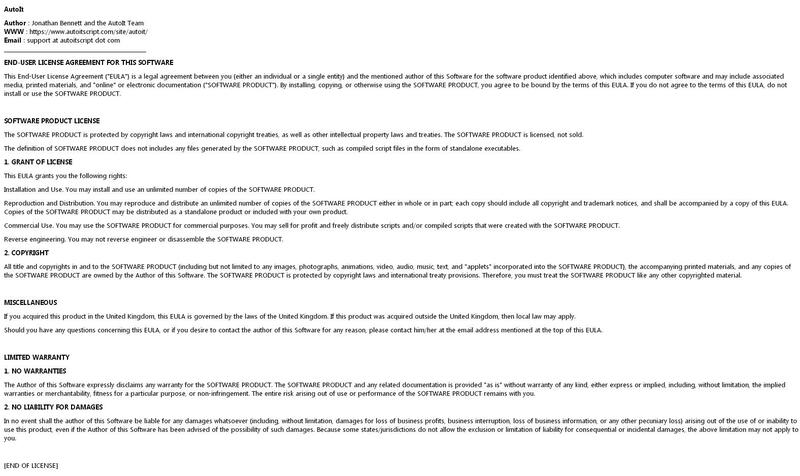 I have reproduced the full software license from their website below. Please read through the full terms and conditions. Also, please have an eye on the license page in their website for any changes.